Upon touching down in Cleveland after winning the NBA Finals, LeBron James strolled out of the Cavaliers' team jet with the Larry O'Brien trophy raised above his head while wearing a T-shirt that appeared to be a not-so-subtle dig at his vanquished opponent, the Golden State Warriors. James, in an interview with Business Insider's Alyson Shontell, said that the 'Ultimate Warrior' shirt he was wearing was a total coincidence. James: Well, it's funny because my wife bought [it earlier]. She asked me who my favorite wrestlers of all time were, and I told her Sting, "Stone Cold" Steve Austin, Ultimate Warrior, The Undertaker, and Ric Flair. Those are some of my favorite guys ever from growing up. So, one day I get home from practice, and there are these T-shirts laying in my bedroom, and my wife purchased them from a store. I packed them all throughout the playoffs. And the shirt that I had on to come home in, I wore in Vegas, and my teammates sprayed me with Champagne. It got soaking wet, so I had to throw it in the trash, and the only other shirt I had in my bag was my Ultimate Warrior T-shirt. James: That was the only one because all our bags were underneath the plane. So the only one I had was the Ultimate Warrior T-shirt that was packed in my travel luggage. And that's what I put on. Everybody thinks it was set up that way, but it really wasn't. It kind of worked out that way. Shontell: But what if you had lost? That shirt would not have been on if you had lost. James: That would have been the T-shirt I'd have had on still. Or I could have done the J.R. Smith and not worn a T-shirt. Not to say James is flat our lying here, perhaps just stretching the truth a little, but it sounds awfully convenient that the only other shirt he had packed pretty plainly referenced the team his Cavs had just beaten in a historic seven-game series in which Cleveland became the first team in NBA history to recover from a 3-1 deficit to win the Finals. 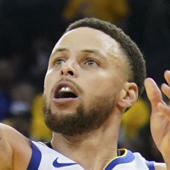 Never mind that that they did it against the team that set the bar as the greatest regular season team in history, the team with a back-to-back MVP in Stephen Curry that had at least threatened LeBron's reign atop the league, if not overtaken it, and now suddenly he's just coincidentally wearing an Ultimate Warrior shirt after dispatching of all that? Either way, it was a pretty cool move by LeBron whether he meant to do it or not. You make a comeback like that, and put on a performance like he did, and you deserve to get a little dig in. Even if it was, you know, a coincidence.